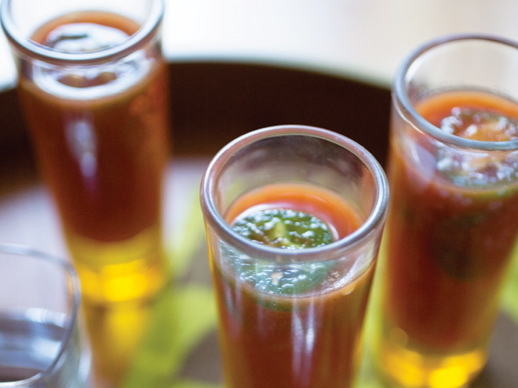 This fiery delight is traditionally served in a copita, a little Mexican shot glass, alongside a shot of tequila. Sometimes it’s accompanied with a wedge of lime and coarse salt, but if you’re using your best tequila (and you should), forgo the additional salt and lime. In a pitcher, combine all of the ingredients except the tequila and stir until the salt dissolves. Let the mixture sit until it reaches the desired level of heat (it will get hotter as the jalapeño infuses the mixture), 15 to 30 minutes. Remove the jalapeño half and discard. Refrigerate until well chilled. When you’re ready to serve, pour the chilled mixture into copitas or shot glasses and serve with your favorite tequila straight up alongside.